Use approximately 2 kg (4½ lbs) chicken carcasses and meaty beef bones, or the meat-bone combination you might prefer. For 10 liter pot (Provides approx. 3½ liters/quarts stock). Approximately 6 kg (13 lbs) chicken carcasses and meaty beef bones, or the meat-bone combination now you might prefer. Cut all the vegetables into roughly equal thick pieces. E.g.. in quarters. Both to open them up for more surface area to brown, and to draw the taste equally from all of them. Brown the ingredients well if you want a dark stock. Pour all ingredients into a large saucepan. E.g. 10 liters. It may not be aluminum as it develops unhealthy compounds. Let it cook for 4-8 hours until all the flavor is extracted. The longer the better. Overnight is fine. Just make sure it is at a very low heat to avoid fires. Or put it in you oven at 105°C (220°F). The stock should simmer very lighlty. Only a single bubble should trickle to the surface occasionally. If you let it simmer without a lid, it is easier to control. It does not spoil the taste of the stock if it boils faster, but the turmoil in the water will separate small particles from the ingredients and make a muddy and impure stock. Be sure to skim the surface for foam and other impurities. You should ladle the impurities of continuously until the stock is boiling. Some protein coagulates and floats up to the surface as a dark "blood foam". This will also be torn into small pieces and make the stock cloudy. Do not remove the film of gelatin floats on the top. This we like. The fat can also destroys the clarity of a stock , and it is of no use in the stock. So that should also be ladled of. I usually have a high slim water jug standing close by, that I pour the surface fat into. It does not matter that there is some stock too. It settles in the bottom of the jug, and then I remove the fat from the glass jug a little more carefully. The stock at the bottom I just pour back in the pan. When I do this regularly I can usually keep my stock free of fat. Others wait until the stock is finished and cooled down. Then you can remove the hardened cold fat from the surface. I think it's easier to do along the way. Stock is the ideal growth media for bacteria, so be careful with your hygiene. If can keep three days in the refrigerator. Every 3 day you can boil it for 10 minutes before cooling down again. This cycle of boiling and cooling will keep the stock fresh indefinitely. Other than that it can easily keep for 3 months in the freezer. What is the difference between a stock, a boullion and a broth? Uh ... Nothing. 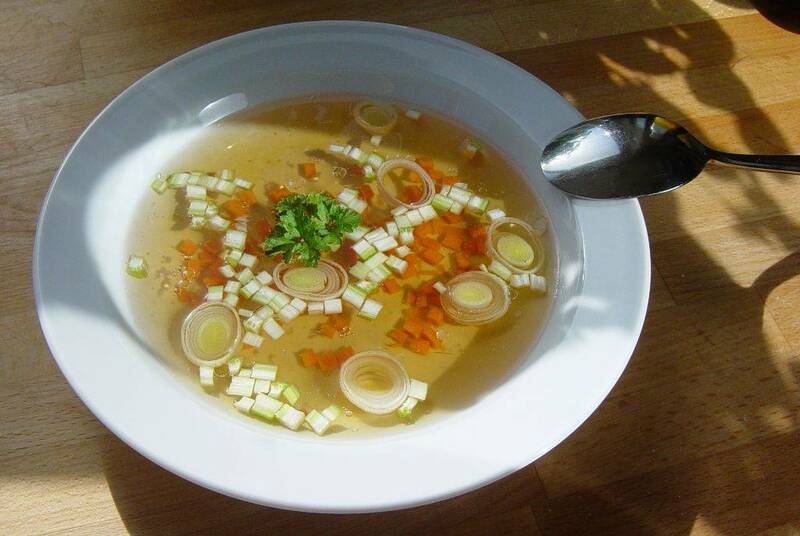 We often use the term stock when it is a sauce and broth when it is soup. But it is the same concoction that is in the pan. There are light and dark stock. The dark will be made by grilling or frying ingredients before boiling the flavor out of them. The light is made just by boiling the ingredients without browning. Light stock is used for mild sauces and soups. Dark stock is used for sauces and strong soups. The light is the easiest to make, and the easiest to get clear/transparent. Stock is normally made of three parts. Meat, bones and vegetables. The meat provides protein and flavor. The vegetables provide carbohydrates and taste. The bones provide mainly gelatin. But they also contribute a lot to the taste. Especially if you can crack them so the marrow is in the water. The most usual is to boil a stock of chicken, veal or beef. That is neutral in taste and can be used for almost anything. It is rare to use pigs, lamb, goat, goose, duck, etc. as they color the taste too much. It is too obvious to taste what the stock is made of. Veal and beef makes a slightly darker stock. Most cooks today use only light or dark chicken stock. It is easy and inexpensive. But it make a much better and stronger flavor if you simmer some meaty beef bones, or other beef or veal along. Do not buy expensive meat for making stock. Have you dismembered a whole raw chicken and cut the carcass and bones away. Then freeze it down for making stock later. Have had fried chicken and only the bones and wings are left? Then freeze the rest down to make stock later. When you cut fat and tendons of beef before or after cooking. Then freeze these leftovers for stock. you can harvest amazing "stock material" from everyday leftovers. Not to mention the vegetable leftovers. Just beware that ther leftovers are not too spicy, salty or smoked. Or has been in the grill. Otherwise it is also very suitable to cook whole chickens and then use the meat for something else. If you are an absolutely fanatical home cook, you can make "double-stock". It is a two-step process. You first make a stock only with bones, and then use that stock in the recipe as above, but with meat only instead of bones and flesh as the recipe says.